You may think the slings and bum bags of the world can barely hold anything, but that's not exactly true. The beauty of using a small bag, at least for us, is it forces one to meticulously curate the items they want to bring with them. 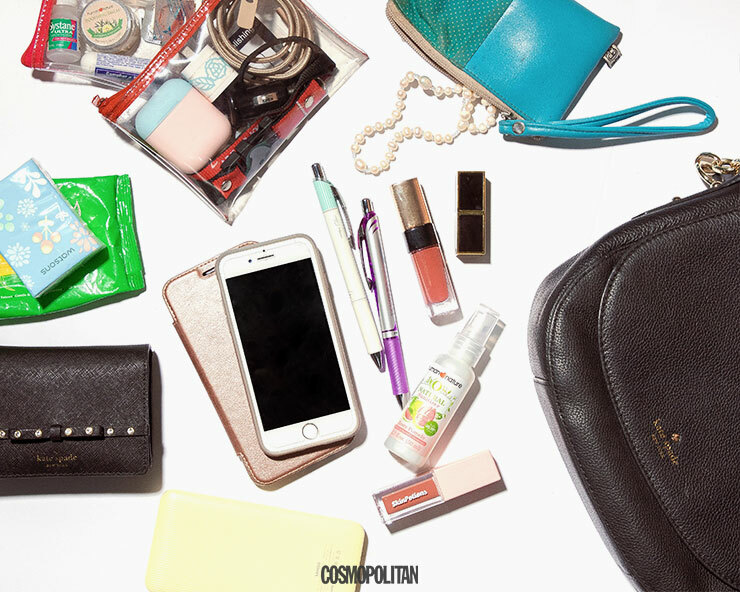 Because TBH, every time you go out you won't always be needing a roll of toilet paper or a travel-sized bottle of dry shampoo. Why did you choose to include those products in your bag? To be honest, it's hard to fit things inside a bag THIS small, so I usually bring a larger one. 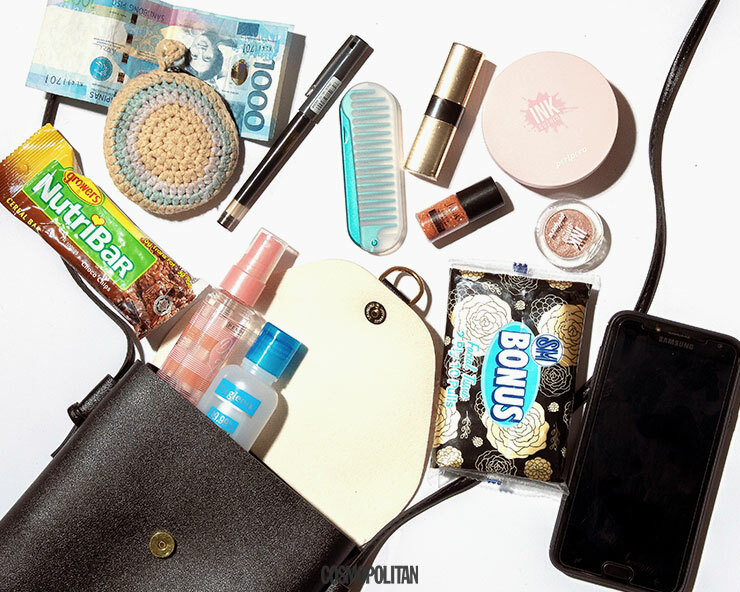 But whenever I do need to bring a small bag to an event, or when I go out, I usually bring the essentials such as money, lipstick, my phone, and a small tissue pack! As much as possible, I try to include a small snack, because I never know when I'll get *munchy* and I don't like being "hangry." Every time I use a small bag, I always make sure to pack only the essentials. 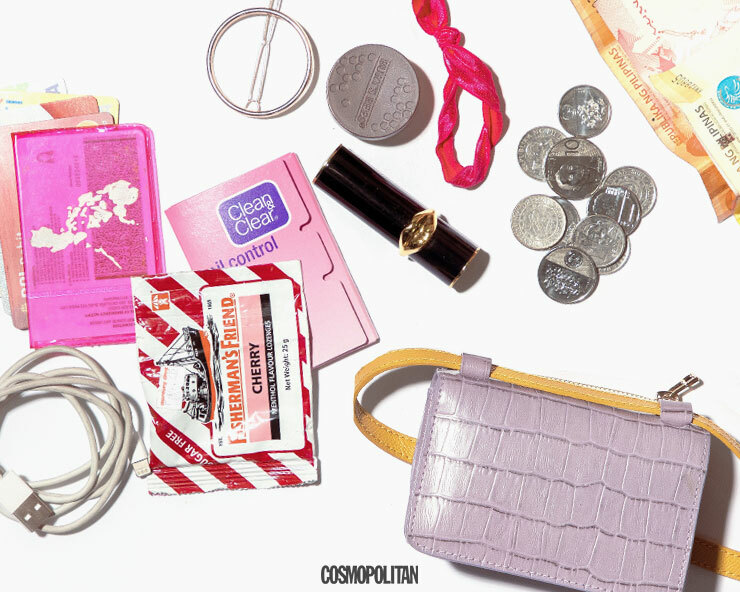 If I had to narrow it down to the most important items, it would be my cash, cards, IDs, tissue, lipstick, and perfume. I never leave the house without my driver's license—I need it everytime I drive. It's also comforting that I have something with me just in case I need to present a valid government ID somewhere. My ATM/credit cards are on top of the list, too, because who knows when I'll need extra money (read: Shopping, LOL). Tissue is A MUST for me because apart from being super handy when I need to go to the restroom, I also use it to blot sweat because I'm pawisin. Hello, Manila summer! 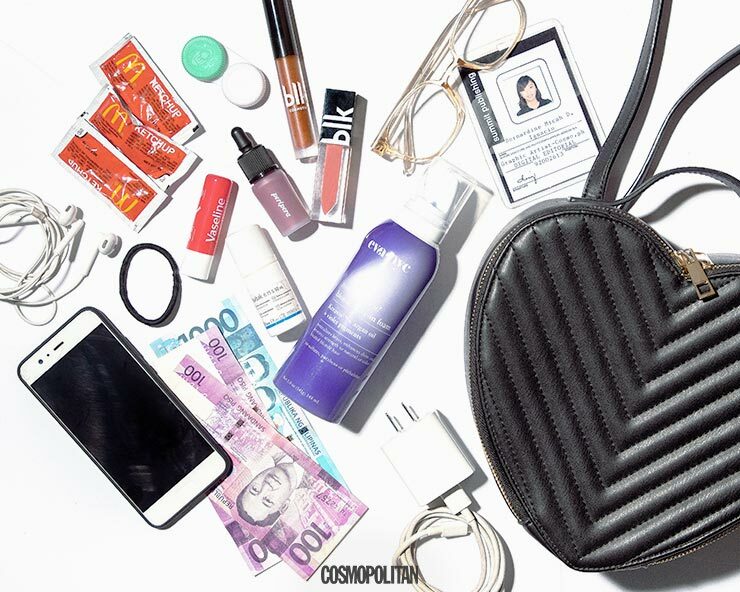 My kikay essentials—lipstick and perfume—are what I use to look and feel good all day. 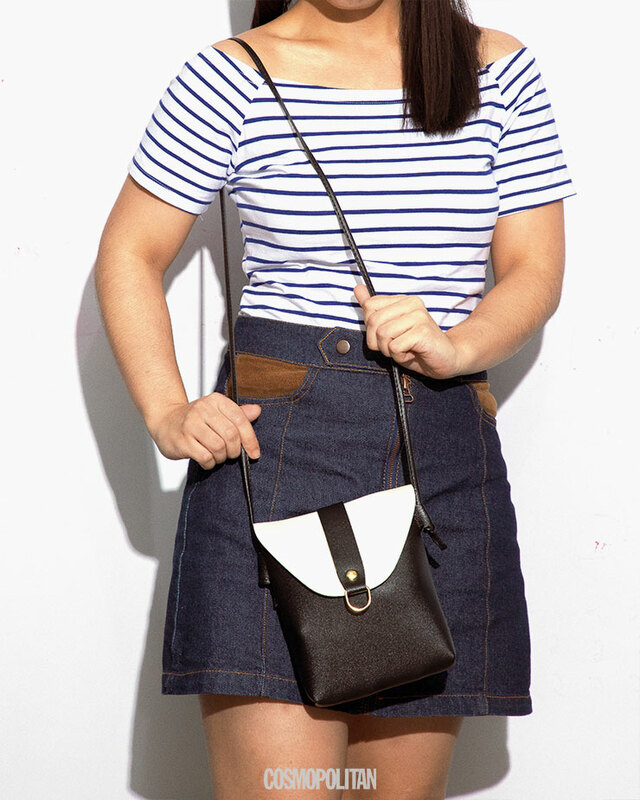 What I love most about this crossbody is its design. It already has compartments for my cards, bills, and coins, so I don't need to pack an extra small pouch for money. It's like a built-in wallet inside the bag! The Girl Scout motto is "Be prepared." I feel ready to go through my day if I have the following items with me: lip balm (I get chapped lips quite easily), eye drops (I had LASIK done so I'm prone to dry eyes in the mornings), a small mirror, a Tide stick (always useful, especially when you're wearing white), my wallet, a separate card wallet for all my membership cards, a medicine pouch, a pack of tissue, a pen (you never know when you'll need to sign something or fill in a form), and my Epipen for severe allergic reactions. And of course, a pair of shades because it's currently summer, aka hot AF. 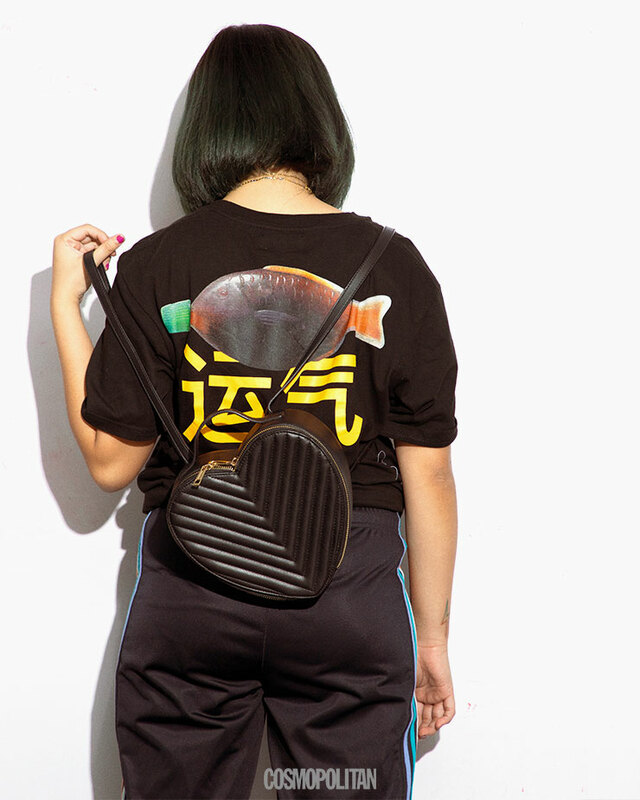 When I saw this bag in the mall, I immediately fell for it because I'm a sucker for cute, structured bags. Although it has an irregular heart shape, it can fit a lot! Now that I have colored hair, I always bring a hair toning foam with me that instantly fixes brassines and acts as a leave-in conditioner, too. I also bring three different lippies—an MLBB, a red, and a bright plum one—because I want to be able to change my lip color depending on my mood. And just so I'll have options for spontaneous trips with friends. 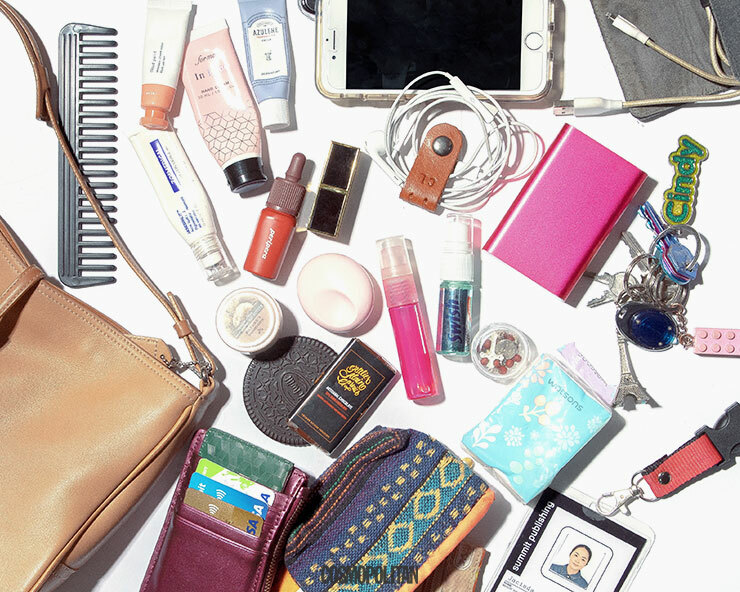 Basically, my tiny bag essentials are categorized into: kikay kit, IDs/cards, tech, and snacking essentials. All the cards in this bag are the ones I think I'll need in case of an emergency. I always have my driver's license with me, even if I don't really drive, because it's a valid ID that's accepted anywhere! I don't bring a lot of cash with me when going to work because I don't want to be tempted to spend too much money. The candy, oil-blotting sheets, hair tie, hair clip, lipstick, and lip balm are all the things I need to refresh myself if I need to head out to an event or meeting. Of course, I can never leave the house without my USB cable because I always charge my phone at the office. Ed's Note: I bring my phone with me everyday but I didn't include it here since it can't fit in my bag, LOL! 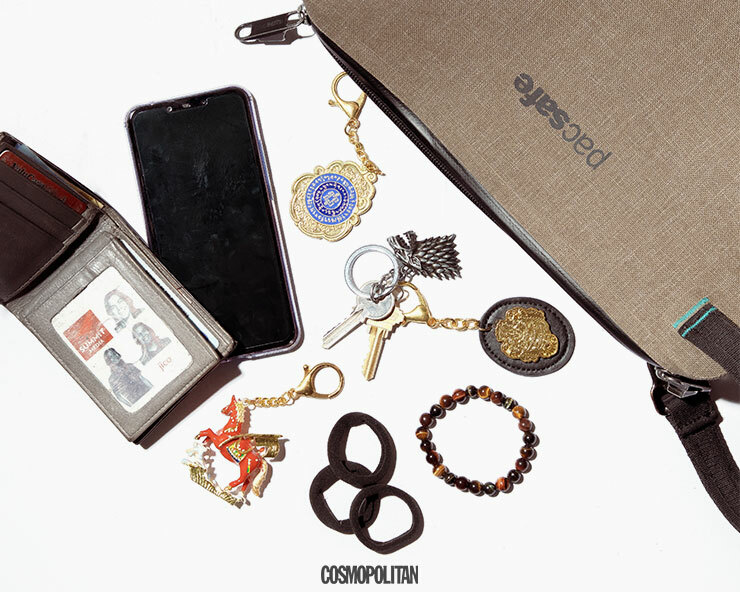 My wallet (and all of its contents), phone, and keys are in any bag I use, for obvious reasons. Side note: My wallet is from my best friend, a gift she gave all of her bridesmaids when she got hitched last year. My hair is long and thick so I never leave the house without a hair tie. I've been more experimental with my makeup lately—I'm moving away from my typical dark shades and trying glitter and gloss. The hand cream is also a gift, and I've been using it because Park Bo Gum is almost here, lol! A recent cough + cold combo coupled with the extreme weather change have triggered my asthma, so I'm back to carrying two inhalers. Lastly, I have some sort of snack with me at all times because I get headaches from the heat. 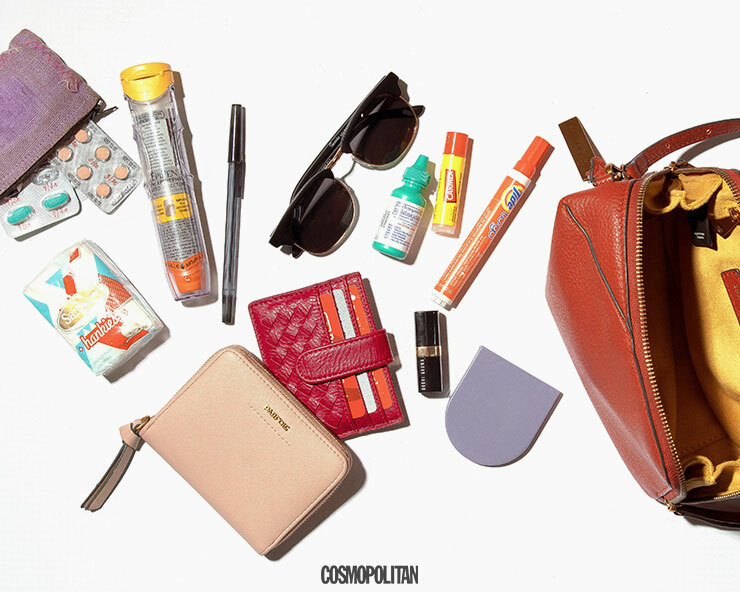 Even if my bag is small, I like to bring as many things as I can because I can never be too prepared for an emergency! From money (cash and cards) to lip balm to lotions (Plural!) to my packet of different kinds of medicines, my bag houses all the essentials I need when I am away from home. 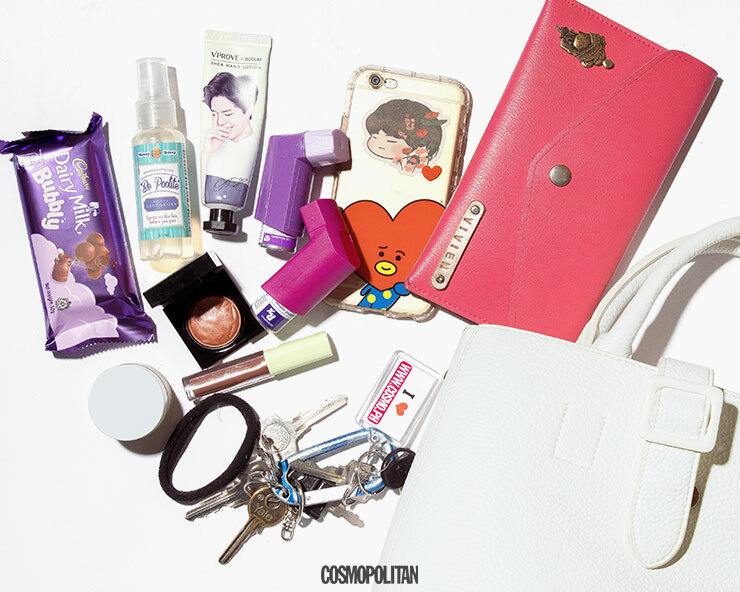 I think all these things fit my "small" bag because I pick out small items as well! I constantly edit the contents of my bag depending on the occasion and rarely leave my house without my "checklist" of essentials. 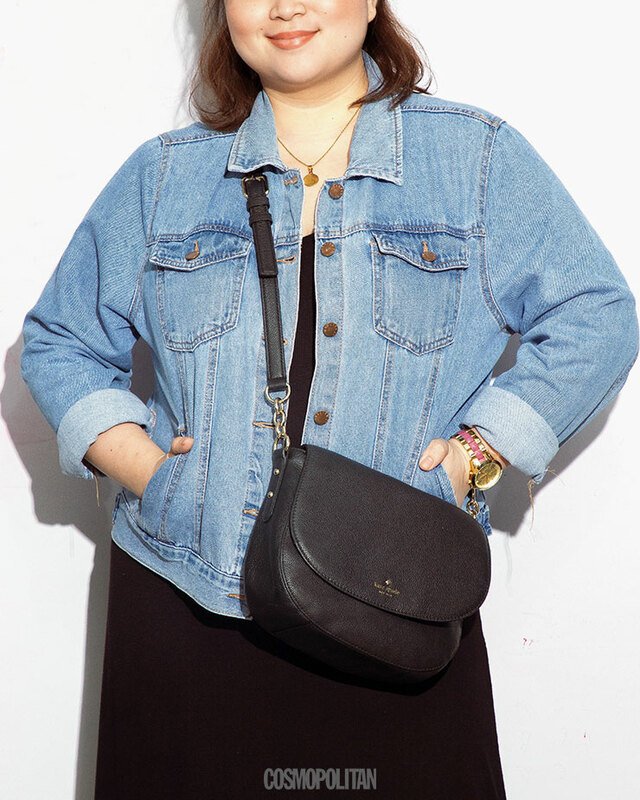 I've been into belt bags lately because I could walk around the city hands-free, with my essentials safely placed in front of my body. I'm quite paranoid with my stuff. Even in the poshest malls, there are still people who do not have the best intentions. It's a sad truth. 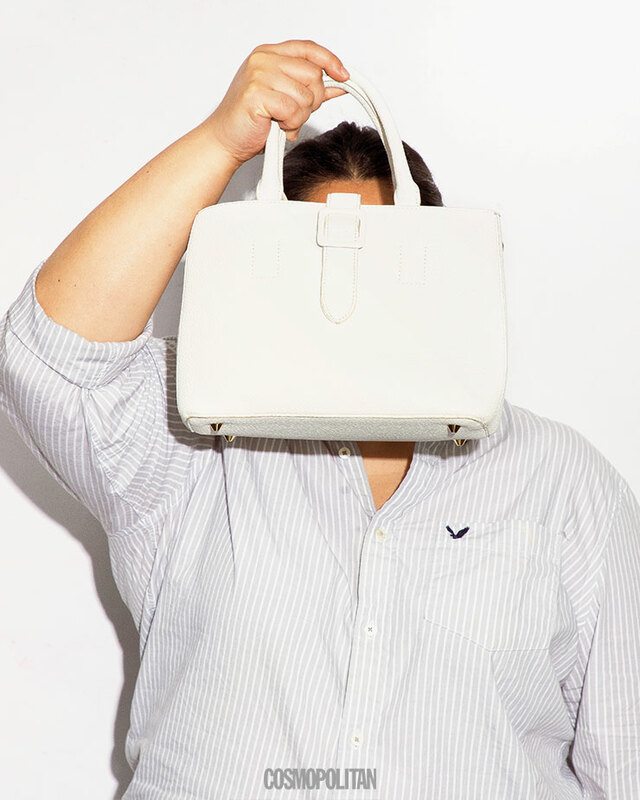 At first glance, my flashy neon bag looks tiiiny, but it can fit a lot! I bring a card case for well, my cards, my life. LOL. My leather wallet contains cash and receipts. I never leave home without my earphones, because listening to music keeps me sane during traffic. I also find this handy when I'm eating alone in a restaurant. It says "DND" all over my face. And yes, I do take BC pills and use a feminine mist. I care about my V's health very much. 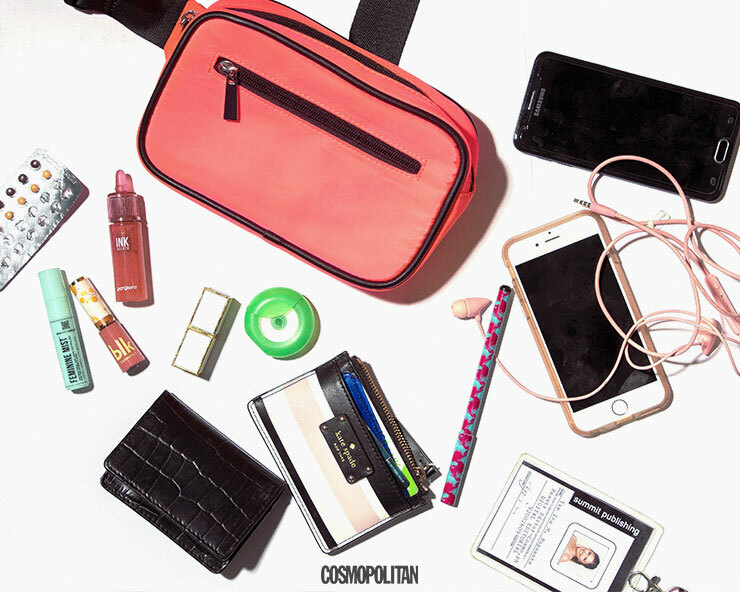 And because I have a tiny bag, I can't bring a lot of makeup products daily. I just bring the essentials. It is rare that you'll me without pink eyeshadow, and I recently discovered BLK's liquid pink eyeshadow from their second K-beauty collection. 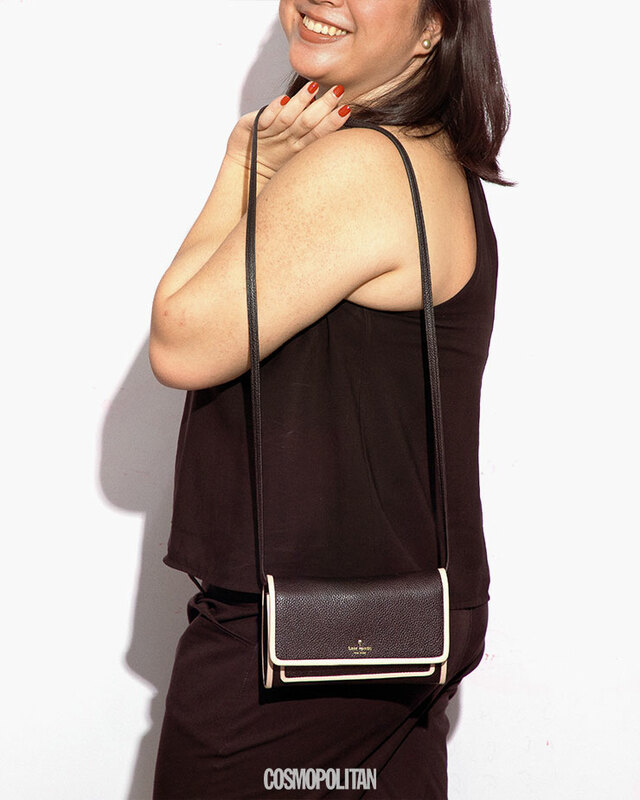 I am obsessed with it because it's easy to use and it fits my bag! The Peripera tint and Tom Ford lipstick aren't bulky, so they definitely belong here. Full disclosure, though: I have a gym bag, and it is there where I store my other daily essentials: my keys, coin purse, sunglasses, hand sanitizer, phone chargers, and water bottle. These are my basic necessities when going out. I used to put them all in my pocket, but I hate it when my phone and wallet bulge on my skinny jeans, haha! The feng shui amulets are supposed to bring me safety and career blessings. The reason I can't bring around a bag any smaller than this is because I like to carry around a lot of things—I like being prepared. I carry around a medicine kit, a miscellaneous kit (for my Airpods, office ID, and other things that I don't want to just be floating around in my bag, and a blue pouch where I put my rosaries and prayer booklet. Since switching to a smaller bag, I also switched to a smaller wallet that can fit my cash, cards, and IDs. I don't think I'll ever be carrying a long wallet ever again. 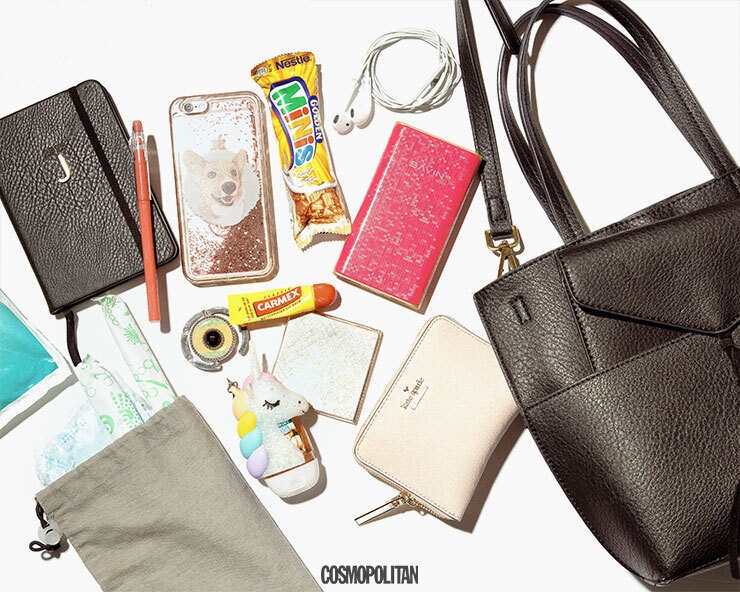 The other stuff are pretty basic: tissue, wipes, pens, hand sanitizer, phones, a power bank, and several lip products. At the end of each week, I try to clear out my bag because by Friday, it's usually cluttered and heavy AF from random coins and one million other lipsticks that I randomly throw in. If you want to switch to using a smaller bag, I'd suggest to really think about what you want to bring and use small pouches to organize your stuff—it's life-changing! I am eternally guilty of overstuffing my bags, so my definition of a "small bag" is probably already medium-sized for some. I always bring: my wallet (with keys inside), hand sanitizer (the one I have is in a light-up unicorn from Bath & Body Works, and even though it's big AF, I bring it along 'cos it's such a cute convo starter), a mirror (to check my teeth after eating, LOL), lip balm (for no-lipstick days), tissue (to blot and mattify), and my planner + erasable pen. I also typically bring my phone power bank and two mobile phones (one personal, one for work). Recently, I've been bringing face masks (the medical kind) because a bad bug's been going around and everyone I know has been getting sick with the cold or flu, myself included. It's just always good to have it available, especially for crowded spaces like malls (Ugh, yes, I'm kind of a germophobe.). 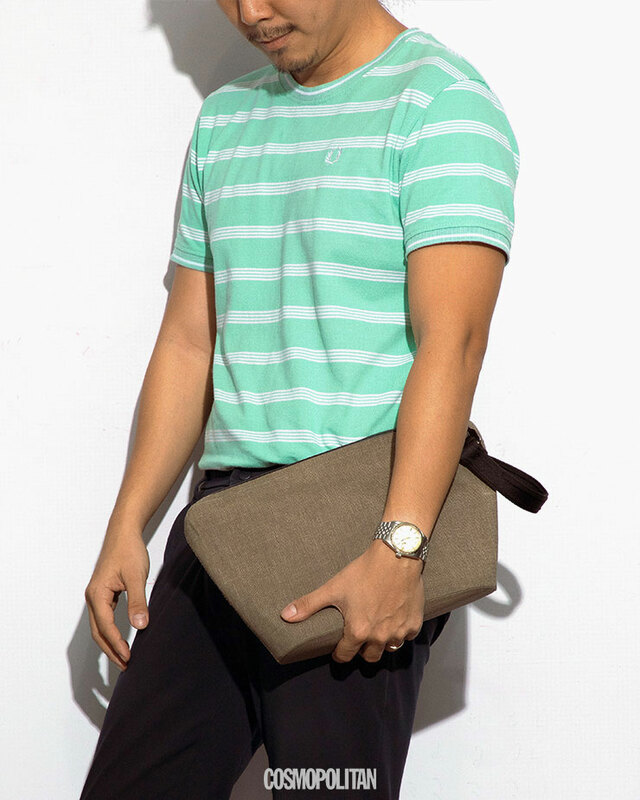 This bag's pretty cool because the front part can be detached and turned into a clutch. So when I'm at work and I need to go to a semi-formal event, I have two bags in this tote! 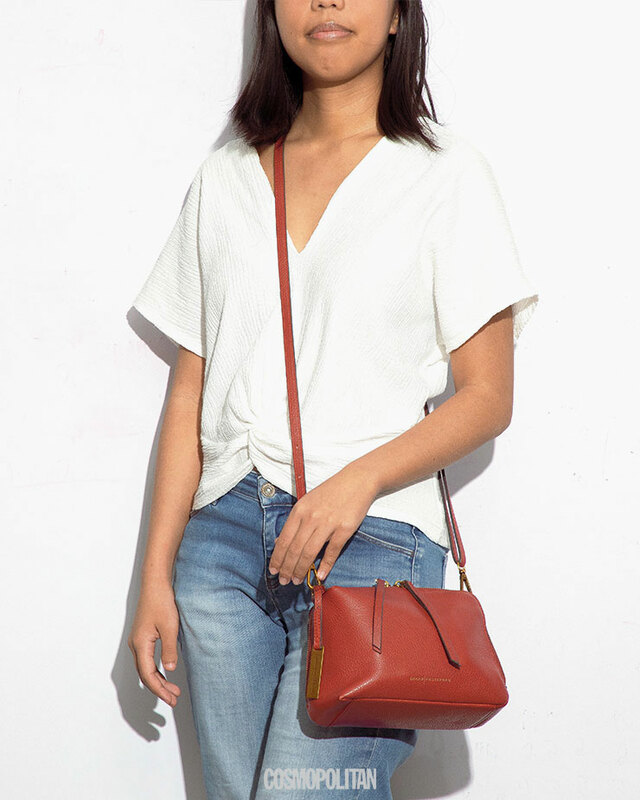 Do you prefer bringing small bags or are you more secure with a large tote bag? Let us know in the comments! 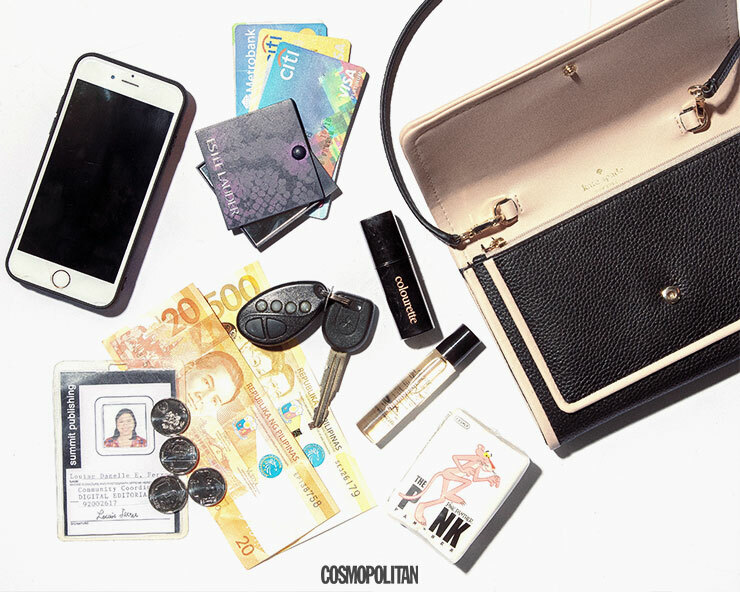 You can also post a "What's Inside My Bag" in your IG stories and tag @cosmopolitan_philippines. We'd love to know!